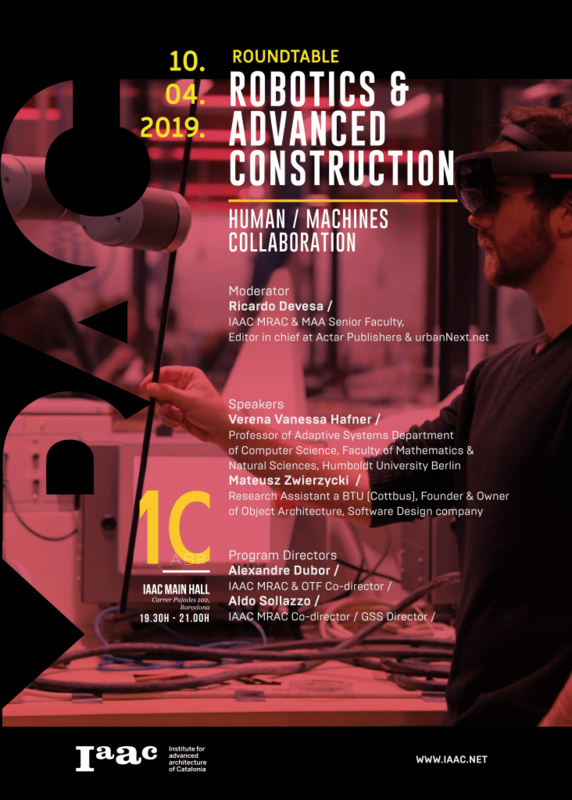 On April 10th IAAC will host a roundtable with experts in the fields of architecture, robotics and construction to discuss the potential and challenges faced by this sector in the face of emerging technological innovation. Advances in Human-Machine Interactions and mixed realities allows for a seamless collaboration between humans and robots, taking advantages of the best of both virtual and real world. This and many other topics will be part of the debate on Wednesday at IAAC at 7:30 pm. The event is free and open to the public. The debate will be moderated by Ricardo Devesa, IAAC Senior Faculty and Editor in Chief of UrbanNext. The event is organized by the directors of the academic programme Master in Robotics for Advanced Construction (MRAC), Aldo Sollazzo and Alexandre Dubor. In addition, Verena Vanessa Hafner, Professor of Adaptive Systems Department of Computer Science, Faculty of Mathematics & Natural Sciences, Humboldt University Berlin and Mateusz Zwierzycki, Research Assistant a BTU (Cottbus), Founder & Owner of Object Architecture, Software Design company, will be with us to talk about all these issues.